Website and asset locker for Arts Alliance supporting worldwide release of KURT COBAIN: MONTAGE OF HECK. Multi-language microsite supporting the global release of Brett Morgan’s intimate rock doc. 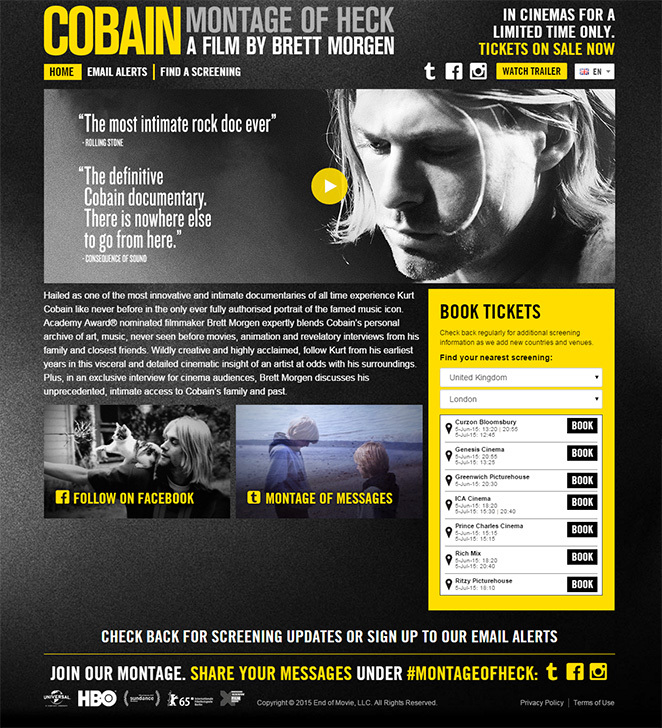 Our official site for KURT COBAIN: MONTAGE OF HECK made tidy use of WordPress and integrated cinema listings to offer a low-friction user experience for anybody wanting to find out more about the film and where it was playing in their market. As well as the website we ran an asset locker for this release making print, AV, digital and press assets securely available to exhibitors and distribution partners globally, and providing versioning and localisation support across a wide range of marketing materials.